The Jam Factory presents an Exhibition of Contemporary Cartographic Art inspired by maps and map-making. 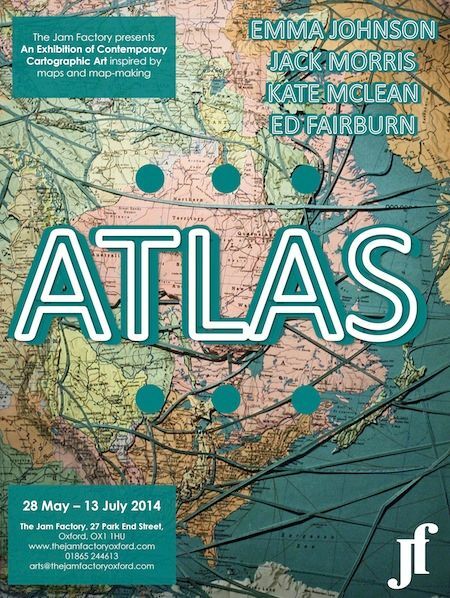 This exhibition features pieces by Emma Johnson, Jack Morris, Kate McLean and Ed Fairburn. Drawing inspiration from those unique schemas of distance and demarcation; neither abstract formalism nor pure semiotics, ATLAS celebrates the beauty of cartography and its ability to carry us thousands of miles, across ocean and mountains, from pole to pole in a hand full of inches. Emma Johnson: My work deals with issues of deconstruction and transformation, the recycling of materials and the ambiguity of communication, as well as the obsessive repetitive actions used in the making of the work. Found objects are reconstructed into artworks which stand as a tangible and symbolic presence of the information contained within, but are virtually unreadable: linear communication made illegible. Jack Morris: I consider my art to be a form of cartography. However, rather than attempting accurately to replicate what the city looks like, I seek to convey what the city feels like; amalgamating the dynamic, vivacious, exciting and hostile ambiences of the urban landscape and illustrating them upon the canvas. It is a unique form of cartography, a visual representation of the atmospherically rich urban landscape. Kate McLean: My business is graphic design. My environment is design education. My obsession is cartography. I create sensory maps. I teach and practice a subject whose content and media are fluid and constantly evolving; a subject whose limits are determined only by imagination & creativity.